Dr. Tameka Funny is a graduate of Towson University in Towson, Maryland, where she received her Bachelor of Science degree in Biology. She then went on to attend the Philadelphia College of Osteopathic Medicine to obtain both a doctorate degree in Osteopathic Medicine, as well as an MBA through their dual degree program. She completed her Internal Medicine residency, as well as Infectious Diseases fellowship at the University of Medicine and Dentistry of New Jersey. 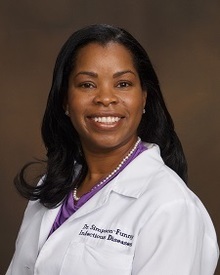 During medical school and residency, she was bestowed with multiple honors and awards including membership in the SigmaSigma Phi National Honorary Osteopathic Society, as well as being nominated for the Simmy Ginsburg Humanitarian Award. Dr. Funny is double-board certified in Internal Medicine and Infectious Diseases. After completing her training in New Jersey, she had a strong desire to escape the cold snowy winters of the Northeast. She moved south to Tallahassee to be closer to family and start her career as an Infectious Diseases specialist. In September 2011, she joined the Southeastern Center for Infectious Diseases where she has been able to follow her desires to practice sound and dedicated medicine through a team approach. She is a current member of the Capital Medical Society, the American Osteopathic Association, and the Infectious Diseases Society of America. She embodies the spirit of the practice through incorporation of the whole person, mind, body and spirit, in order to cure adult infections. In her spare time, she enjoys outdoor activities, traveling, and has come to support the culture and sports in the Tallahassee community.